I like books. I especially like books that teach me things. Call me a nerd if you wish, but I read books the same way I watch television. If I am not getting anything from it, I am not interested. Not to say I don’t read fiction, I do. However, given I have a short attention span (still not admitting I have ADD!) a book or show really has to grip me – unless I am learning. I was recently asked to review ‘Recovering My Kid’ by Joseph Lee, M. D. I was skeptical at first, but as I read I was fascinated by the wealth of information and tools to help any parent suffering through the addiction of their child. Below you will find my favorable review. The book is available on Amazon and Hazelden. 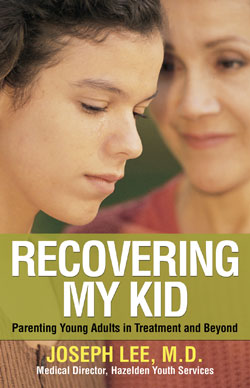 There are three parts which consist of forty-five chapters in the helpful book “Recovering My Kid” by Joseph Lee, M.D. The first part is ‘Frameworks for Emotional Objectivity’, the second is ‘Frameworks for Leadership’ and the third, ‘Frameworks for Understanding Mental Health.’ The book really takes a hard look at how parents can help or hurt when a child is in the throes of addiction and/or alcoholism. What is wonderful about this book is the broken down parts. Also, at the end of each chapter there is a ‘bottom line’ and thought-provoking questions either for journaling, discussion with a partner or a group dynamic. This part will fascinate anyone who wants to know the emotional turmoil of dealing with an addicted child. The chapters cover different aspects of emotional baggage, enabling and codependency. As a mother in recovery with an addicted child, I found myself highlighting parts of this chapter. Guilt is a bullet point as Dr. Lee discusses how it can hinder any parent with the best intentions. Dr. Lee gives examples of emotional objectivity along with enabling behaviors that could be misconstrued as helping your child. There is also a focal point on how leaning too far to the rigid, disciplinary side can hinder a child’s development and sabotage the child’s recovery. Boundaries and consistency are the main focal point of this section. Let’s be honest, without boundaries and consistency, you’re raising a spoiled time bomb that could detonate at any moment. Dr. Lee even asks the painful question: ‘Do I kick my kid out of the house?’ and discusses what your bottom line is. Having (and sticking to) a bottom line is paramount when handling an addicted child. It is so easy to get drawn across that makeshift line in the sand and make any work up until point a waste of time. While the first two sections of this book are packed with useful information and key questions for reflection, the final section is paramount because people cannot deal with something they do not understand. Imagine being thrust into a situation without any education on it and being told, “Okay, handle this.” You’d probably scratch your head while your eyes darted around in a panic. Part three is the key to grasping the “how and why” of your child’s mental development and keeping a clinical mind while in an emotional upheaval. In summary, addiction is a rough road for anyone involved. There are several lines parents cross while they try to assist their child because it is so brokenheartedly painful. ‘Recovering My Kid’ gives clear-cut information and steps to help through the process. A great review. Gave me a clear view of the book’s contents and objectives. Easy to see how helpful it would be for parents found in that situation. Thanks, Gay… I got a lot out of this book… I hope it helps someone.. Have a great day. Your ADD and mine work opposite. I love to read interesting fiction, but it’s hard labor for me to read nonfiction – even directions for things I’ve bought. Darlene, sounds like a great book. In 1965, when my sister started drinking, there weren’t books like this around for my parents. I wish there had been. There was Sacred Heart in downtown Detroit, AA, and some family therapy. I was only three at the time…but I grew up knowing their frustration. My mom used to set an egg timer for five minutes, when Carol would go AWOL. This was for those times when she felt like she might scream, she couldn’t stand being in her own skin one more minute longer, waiting and wondering. The timer would go off, and she would set it for five minutes more. She’d go like that, five minutes at a time. Great review, and seems like the book would help with the alcoholic in general and not just the son or daughter…. Please never apologize for speaking from your heart, Chrissy. I love the idea of the egg timer.. In fact, I may use that in my own life when I get too up in my head about my daughter who recently moved out (age 17) or other crazy crap that comes down the pike that I sometimes have a hard time giving to God. Thank you so much for sharing a part of your story, Chrissy. Have an awesome day.